With complete operational project management built right into the Microsoft ERP, ADEACA Project Business Automation™ (PBA) helps you achieve better process control and reliable timely performance data. ADEACA PBA™ Project Operations is built on Microsoft Dynamics 365 for Finance and Operations, giving you an enterprise ERP tailored for project-based companies out of the box. Eliminate standalone project management applications and the overhead needed to manage them. Project driven companies spend too much time translating, consolidating and validating data from the myriad of point solutions they employ to manage their project operations. With ADEACA PBA your project operations control sits where it belongs – embedded within your ERP solution. Companies whose primary business is the successful delivery of customer-facing contracts know how critical it is to be able to accurately plan those engagements while managing resources, subcontractors, risks, deadlines and related supply chain activities. A lack of real-time insight into your delivery operations will invariably result in increased risk and decreased profitability. ADEACA PBA offers a unique and fundamentally different approach to managing project operations. Featuring a sophisticated planning engine, you need no longer rely on external project scheduling applications and can enjoy complete integration between backend ERP functions and your operational project management activities. The project plan is the central entity against which a host of other operational activities are planned and managed such as: issue & deadline tracking, risks evaluation, staffing, capacity leveling and procurement/production schedules. Key to operational excellence is scalable and predictable business processes. Unless you’re able to manage the process of getting from A to B you cannot accurately measure or appropriately react to the process output. In ADEACA PBA, all critical operational business processes are executed within a single solution with built-in process and audit control. This enables companies to control process flows throughout the enterprise thereby establishing an enforceable and repeatable business model yielding reliable and actionable KPIs. The all-encompassing architecture of ADEACA Project Business Automation™ means that information flow freely and instantly between inter-dependent processes. For example, changes to the project schedule will automatically filter through to the payment plan, procurement activities, capacity profiles, Estimate at Completion (EAC) and cashflow projections. This provides a degree of automation and visibility which is critical in today’s real-time economy but is denied project driven enterprises by generic mainstream ERP solutions. Featuring a sophisticated Work Breakdown Structure (WBS) and based on scheduling principles known from best-of-breed scheduling solutions like Microsoft Project Server, ADEACA PBA™ handles every aspect of your project schedule. 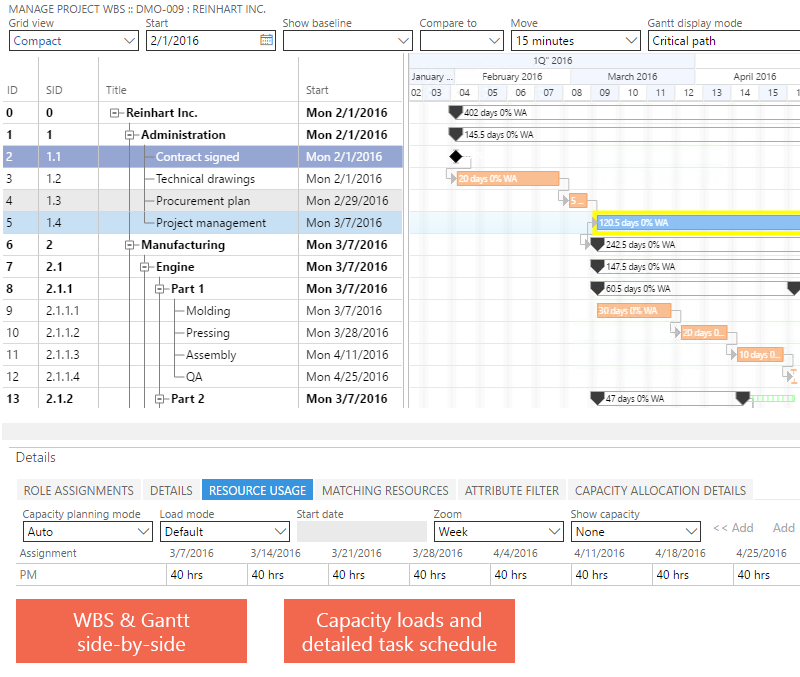 Projects can be scheduled with or without capacity constraints (leveling or infinite) and project capacity plans may be based on detailed individual resource assignments or aggregated job function assignments (represented by roles). Likewise, machinery, tools, and equipment can be capacity managed at a detailed or aggregated level. 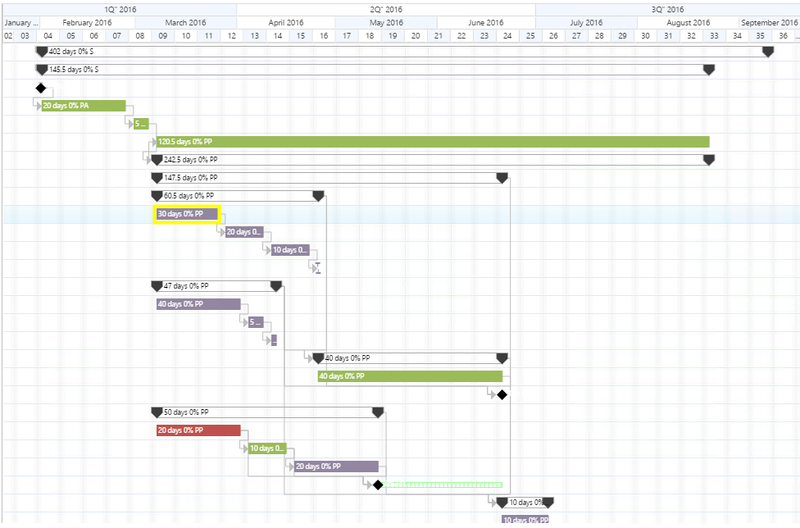 Projects are scheduled individually or in prioritized batch lists. You can also apply simulation models to facilitate what-if scenario testing. The rich Gantt chart combined with traffic light sensor points provide instant insight into project plans and potential problems. 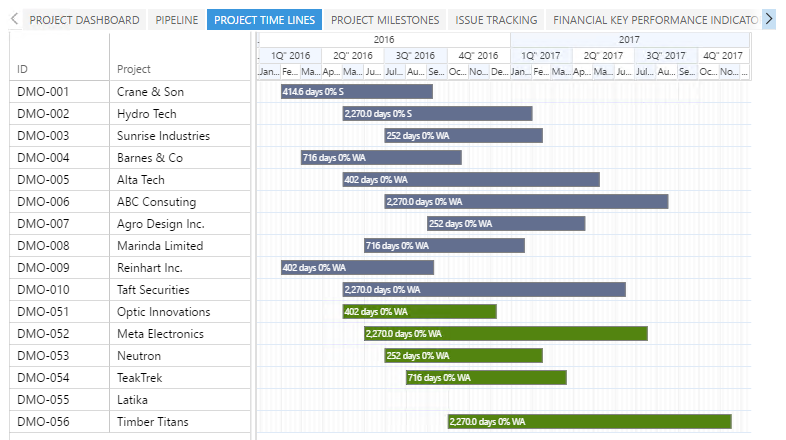 Manage milestones and deadlines to ensure timely delivery and early notification when project plans slide. The issue management system combined with periodic milestone gateway reviews facilitates organized recording of project risks. Linkages between payment plans and supply chain activities to the WBS enable companies to align billing schedules and logistics with project plans and actual progress. Resources may be assigned to project work directly in the WBS (project manager) or via the resource dispatch board (resource managers). 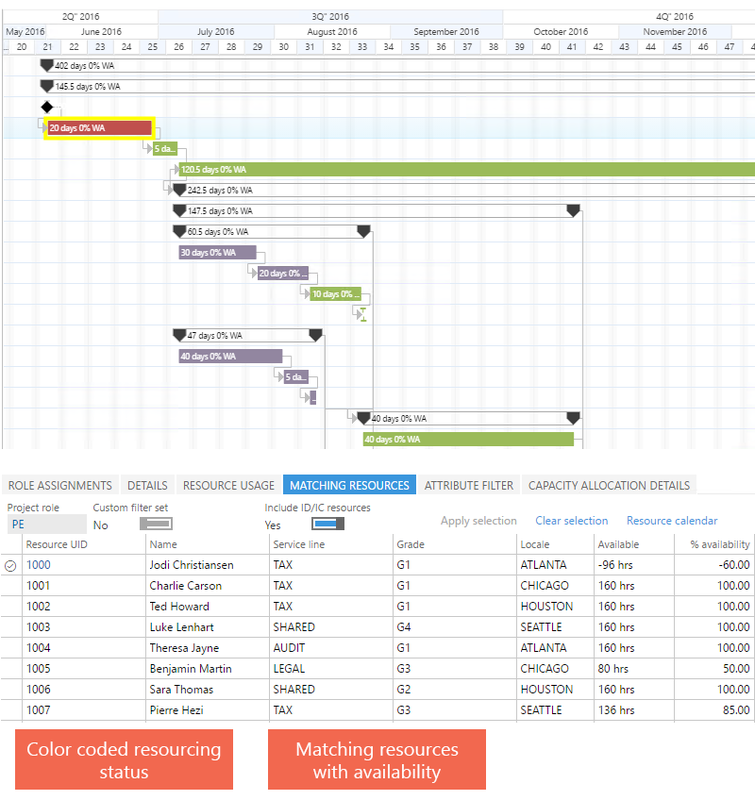 The resource dispatch board provides an easy overview of urgent resource requirements and allows resource managers the freedom to decide which and how many resources to assign based on availability and required skillsets while still maintaining the integrity of the project schedule as defined by the project planner. With ADEACA PBA™ you can segregate resources and projects into resource departments and configure loan rules to determine which departments may utilize resources from other departments or legal entities. The loan management dashboard provides resource managers an instant overview of active and pending loan requests as well as loan change requests. At times of resourcing, you can determine if the resource list should include inter-company and inter-department resources or not. When assigning loaned resources, capacity reservations and assignment notifications flow seamlessly between departments and legal entities. In addition, the self-staffing framework enables project managers to publish unstaffed project work which can then be viewed and requested by individual resources.